The world’s largest Shopping Centre. The Dubai Mall. The Dubai Mall is the world’s largest shopping mall and forms part of the 20-billion-dollar Burj Khalifa complex, which includes a staggering 1,200 shops! It is over 12 million sq ft in total floor area (equivalent in size to more than 50 football pitches). The Mall has a total internal floor area of 5.9 million square feet (55 ha) and leasable space of 3.77 million square feet (35 ha). This is big. Really big. The Mall sees more than 750,000 visitors every week and has become the world’s most-visited shopping and leisure destination, attracting more than 54 million visitors a year. To put this into context Times Square in New York attracts 39.2 million people a year. The scale of this Mall and the surrounding complex is truly phenomenal. You cant really appreciate it without seeing it. But then that could be said for everything in Dubai. The centre is zoned into 10-15 ‘malls within malls’ and each area has a totally unique look and feel. The quality of this environment in terms of design, materials and overall quality is extremely high. Interestingly many UK high street brands are here; M&S, Boots, Waitrose…to name just three of our clients. Also, having worked on a number of Westfield developments in the UK over the last ten years, we understand Shopping Centres from a design and construction perspective. 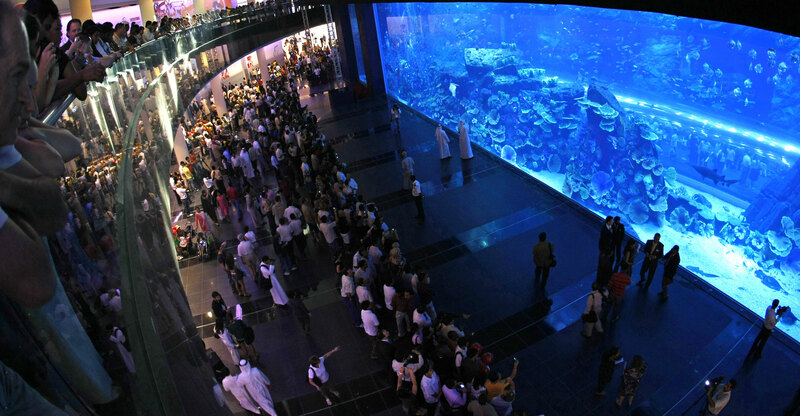 One of many unique and distinctive features of the Mall is the Dubai Aquarium and Discovery Centre. It has the world’s “Largest Acrylic Panel” – measuring 32.88m wide × 8.3m high × 750mm thick and weighing 245,614 kg. The panel can withstand the pressure of the 10 million litres of water used in the aquarium, but its transparency gives visitors clear views of over 33,000 marine animals on display. The aquarium tank itself is also the largest suspended aquarium in the world. 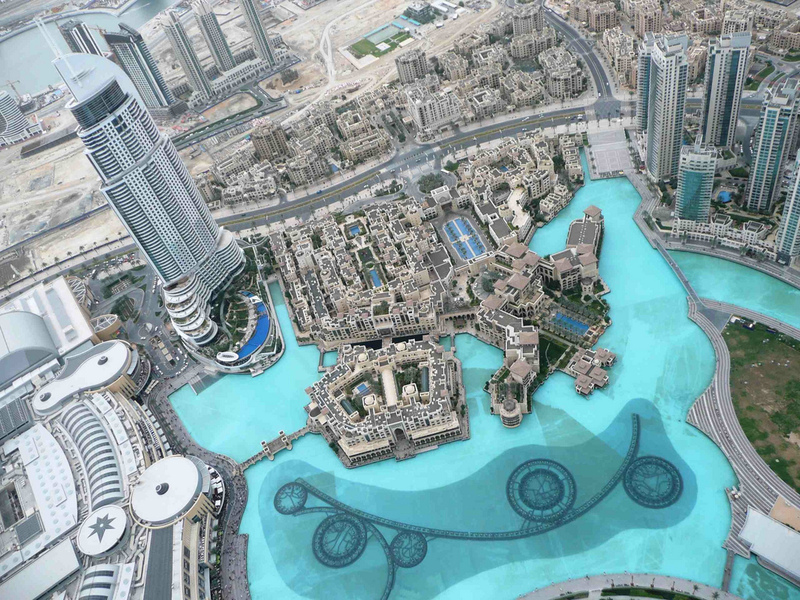 On one side of the shopping centre, externally, is the turquoise 30-acre manmade Burj Kahlifa Lake. Within the lake is the amazing Dubai Fountain. This is a choreographed fountain display, illuminated by 6,600 lights and 25 colored projectors, it is 275 m (902 ft) long and shoots water 70m into the air – that’s over 20 storeys in building height!! The display is accompanied by and synchronised with a range of classical to contemporary Arabic and world music. It was built at a cost of £130m – for something which has no real function or tangible use other than to attract visitors. The photo below is from the top of the Burj Khalifa tower (more on that later). All in all, this is one seriously impressive complex, inside and out. As you walk around you are constantly met with often large and magnificent features of some sort. But this is not the only Shopping centre in Dubai – far from it! There are 68 built to date! Within another, The Mall of the Emirates, is Ski Dubai. This is a 60-meter high indoor mountain (!) with 5 slopes of varying steepness and difficulty, including a 400-metre-long run, the world’s first indoor black run. Adjoining the slopes is a 3,000-square-metre Snow Park play area comprising sled and toboggan runs, an icy body slide, climbing towers, giant snowballs and an ice cave. Ski Dubai is also home to a number of penguins who come out to play several times a day. Unlike many other things in Dubai, it’s actually not the largest in the world, but no other Ski centre is located in such a hot external climate. Controlling this huge environment must consume a huge amount of energy. Sustainability doesn’t appear to be high on the agenda in Dubai, certainly compared with the UK. Unlike so many other parts of the world, fuel is in plentiful supply for everyday consumption and is cheap! But will this last. Here is the strange thing when you consider this huge development over recent years. Dubai has a population of circa 2.2m people, that’s two and a half times the size of Birmingham. However In 1975 Dubai’s recorded population was a mere 375,000. The growth of this place is incredible. Can it sustain this growth? Where will it stop? Money certainly isn’t an object here. That said, the economic downturn did have a major impact on Dubai. But in 2012 it’s picking up again at a vast pace. As are many other places in the GCC/ UAE. So why are these Malls so important? Why are there so many? Simple really; they are true destinations. Not just in their design and function, but in Dubai people really only socialise and enjoy leisure activity in two places; hotels and shopping centres. Nobody walks around outside – it’s too hot most of the time! Because of this I think it’s really difficult to grasp an understanding of authentic culture here. It’s so heavily Westernised. Dubai is mesmerising, fascinating…and confusing – especially when visiting from a country with so much culture and history. I have enjoyed spending some time in Dubai. In reality we got such a minuscule snapshot of the place as our time was primarily consumed in meetings with some great and talented people which, we hope to do more business with. I remain intrigued by Dubai and wonder where it will go from here. Can it continue to grow? Can it sustain itself now? After some challenging years influenced by the global economic situation, Dubai and the wider region is picking up again. 33% of Dubai’s population are Indian. I’m spending the second half of this week visiting our offices in Mumbai to discuss current and emerging opportunities in this region with our team and some new clients. Mumbai is the antithesis of Dubai, although only three hours flight away. We’ve gone from 40 degrees dry heat to 30 degree tropical rain storms. It’s my first visit here also and already I’ve been overwhelmed by the amazing assault on your senses as soon as you arrive.